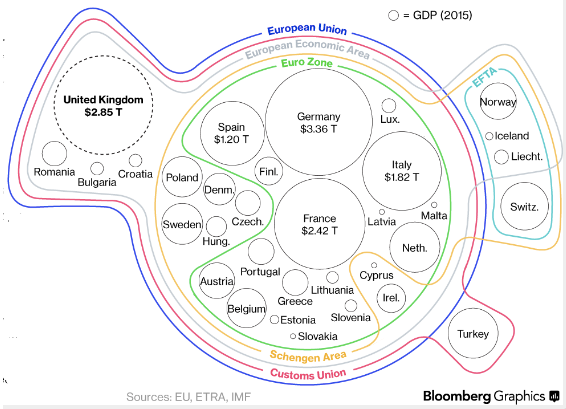 The ties that bind Europe are rather tangled. Looking to the future, we can ask which (if any) of these relationships the UK will select. The UK path out of the EU could take it in several directions. Closest to what they now have economically, the UK could head toward the Norwegian approach with continuing single market participation or, like Switzerland, they could decide complete free access to the single market is unnecessary. Economists like to point out that our decisions are rarely all or nothing. Instead, adding or taking away small amounts, we think at the margin. For the UK Brexit vote, the decisions at the margin involve just how far they will move from their current relationships in the blue, gray and red circles of authority. My sources: A blog with some interesting reading suggestions, The Big Picture had the Bloomberg infographic that led me to this Bloomberg article on what’s next. Please note that the title of this post was edited after publication.